If you’re a frequent reader of this blog, you probably know that we like light-related art and installations. You might even know that we’re fans of Leo Villareal’s work (previously here, and here.) But only a crazy-loyal follower with an exceptional memory would know that we admired an LED light show a year and a half ago on the Bosphorous Bridge and wondered to ourselves why there’s nothing like that in the U.S. So, now, amazingly enough, all three of these elements have come together in Leo Villareal’s (we’re convinced he must be cloned in order to keep up with all the major projects he’s unveiled the past few months!) latest work The Bay Lights. 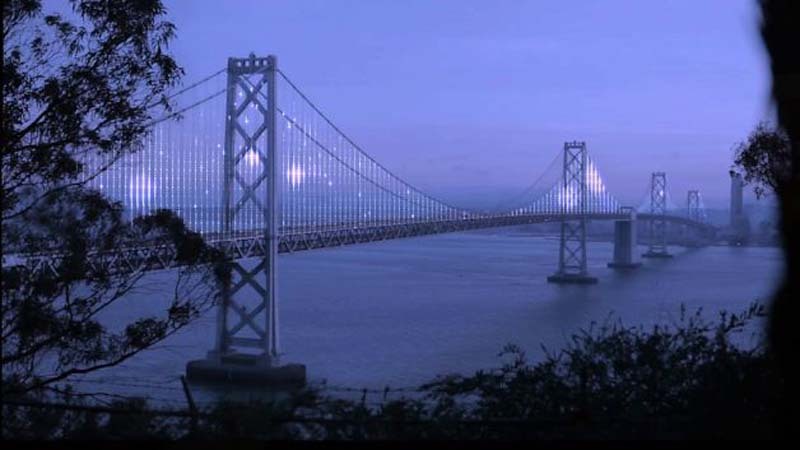 With 25,000 LEDs strung along 5 miles worth of suspension cables, The Bay Lights project is the world’s largest LED light sculpture and it’s all taking place on the San Francisco Bay Bridge every night for the next two years. Villareal has come up with unique algorithms that take their inspiration from the waves and wind of the San Francisco Bay as well as from the traffic that flows over the bridge. The light show was officially unveiled two nights ago. If you’re not in San Francisco, like us, you can take a look at the video below to see the animated lights in action. This entry was posted in Architecture, Art, Light, Stuff We Like. Bookmark the permalink.